LOS ANGELES, CA (February 1, 2018) – BOOM! Studios and 20th Century Fox Consumer Products announce PLANET OF THE APES: VISIONARIES, a new Original Graphic Novel, releasing in August 2018 as part of the 20th Century Fox Uncovered collection. BOOM! Studios searched the 20th Century Fox film archives and unearthed the first screenplay for the original Planet of the Apes (1968) movie, written by Rod Serling, and adapted into comic book format for the first time as a part of the 50th anniversary celebration of the film. The first Planet of The Apes (1968) film is an adaptation of the French novel La Planète des singes. On the road to making the landmark science-fiction classic, 20th Century Fox commissioned Rod Serling to adapt the source material. Serling’s first draft, which was drastically revised before filming, is a radically different vision of the franchise than the one the world has come to know and love. This is the world you know from the acclaimed Planet of the Apes film series, but with key differences – Taylor is Thomas, and Ape City isn’t a crude, primitive grouping of huts; instead, it’s a bustling and urbane metropolis filled with cars and skyscrapers and a vibrant Ape culture. 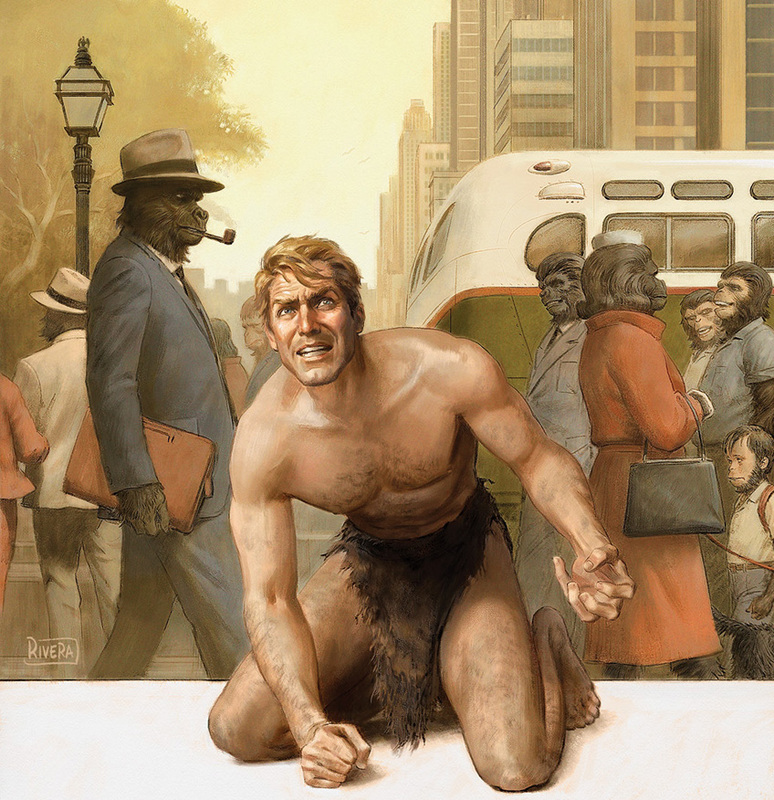 In a world where Apes wear modern clothes, drive modern cars and rule the late night talk show scene, the arrival of one man will forever change how Apes – and Humans – view themselves. Using the original 1966 makeup test and concept art as a jumping off point, discover an all new, yet classic “look” to the classic franchise in PLANET OF THE APES: VISIONARIES which also features a stunning cover by Eisner award-winning superstar Paolo Rivera (Daredevil). This landmark graphic novel continues the year long celebration of the Planet of the Apes 50th Anniversary at BOOM! Studios, which has included all new comic book series, coloring books, archival collections and more. PLANET OF THE APES: VISIONARIES is the latest release from BOOM! Studios’ eponymous imprint, home to a world-class group of licensed comic book series and ambitious original series, including Mighty Morphin Power Rangers, WWE, Big Trouble in Little China, Victor LaValle’s Destroyer, Mech Cadet Yu, Grass Kings, and Klaus. Print copies of PLANET OF THE APES: VISIONARIES will be available for sale in August 2018 at local comic book shops (use comicshoplocator.com to find the nearest one) and book stores. Digital copies can be purchased from content providers, including comiXology, iBooks, Google Play, and the BOOM! Studios app. For continuing news on PLANET OF THE APES: VISIONARIES and more from BOOM! Studios, stay tuned to http://www.boom-studios.com and follow @boomstudios on Twitter. This is unbelievably-cool… and long overdue, from the sounds of it. I’ve always loved The Twilight Zone, so Serling can do no wrong in my house. This is exceptionally good news. Honestly, it is not that often that I get giddy over a press release. I love the cover art too! As a huge fan of both Planet of the Apes and the Twilight Zone (and Rod Serling in general), I’m very much looking forward to this. I’d heard all about Serling’s original screenplay, the film still turned out to be a classic but this will surely be a delight and another great addition to Boom’s already excellent library of Apes comics! This is an excellent example of what a comic book publisher can do with the rights to a franchise. Cool thanks for sharing – and for taking the time. Glad to spread the news.